What A Day! (2.8.18) - OCEANS, Inc.
WHAT TODAY HAS TO DO WITH THE 1859 “WEEPING TIME” SLAVE SALE IN SAVANNAH, GEORGIA. What’s in a day? and what’s in a day’s past? Are days connected the way humans are—to (day) parents, grandparents, great grandparents and beyond? We celebrate birthdays, and other anniversaries precisely because, yes, we believe that certain days are connected, through time, and, by us. Perhaps it is rather that we are connected through, and by, the days (and time). Today, February 8, 2018 is a day saddled with a poignant American history that few know, or talk, about. It is important, though, that we know and talk about, and commemorate, this day. 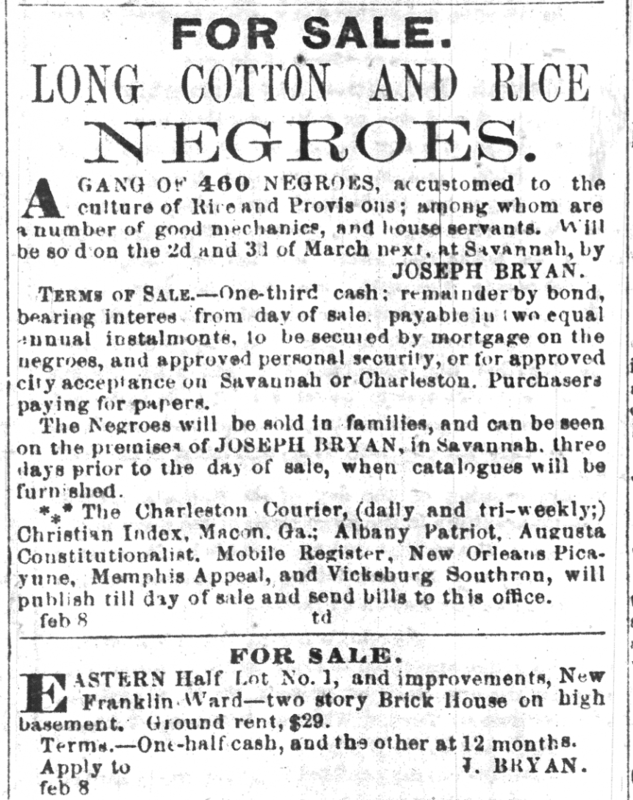 Today’s ancestor, February 8, 1859 heralded doom and upheaval for 460 African American men, women, girls and boys who were advertised for sale in antebellum Savannah, Georgia. They were approximately half of the 919 enslaved Africans and African Americans who toiled, daily, in two coastal Georgia rice and cotton plantations belonging to the Mease Butler family of Philadelphia, Pennsylvania. The 1500-acre rice plantation was located on Butler Island in the Butler River, a branch of the Altamaha River that flows past Darien, Georgia, into the Atlantic Ocean. A few miles downriver from Butler Island, on the north end of Saint Simons Island, was the Butler family’s 1600-acre Hampton cotton plantation. The initial proprietor of the plantations, and progenitor of the family, Major Pierce Butler (1744-1822), was an Irishman who settled in Charleston, SC, and married into the wealthy slave-holding Middleton family. Major Butler started the Georgia plantations circa 1793, and left them in the hands of overseers (including Roswell King, Sr., who later founded Roswell, Georgia!). Major Butler became South Carolina’s first United States Senator, is a signer of the U.S. Constitution, and domiciled in Philadelphia when it was the seat of United States federal government. It was there that his children and grandchildren, absentee landlords of the Georgia plantations in turn, lived. It was his grandson, Pierce Mease Butler (1810-1867), who authorized the 1859 slave sale. As the accompanying advertisement from the Savannah Republican from 159 years ago, shows, February 8, 1859 was a sad day, indeed. The day was impregnated with imminent horror for 429 men, women and children who were ultimately sold on March 2nd and 3rd, 1859 at the former Ten Broeck horse racecourse which was located about three miles west of Savannah. For seven people, also advertised, but not sold, it was a close call answered only by the exigencies and mercies of fate and courage. So, today’s ancestor was a sad day indeed; one that saw the conception of imminent birth pangs from the impending slave sale’s separation of mothers and children; and death throes as fathers were untimely severed from their progeny; lovers were torn apart by the most permanent heartbreaks, and siblings were divorced forever. All these tragedies and their concomitant progenies were couched and shrouded in the words of the slave sale advertisement, ordained on paper with the certainty of ink. Inherent in the slave sale ad were looming travesties that set in motion the rolling and roiling destinies of innumerable generations—people who, though ultimately emancipated in 1863 (or 1865 effectively), would be scattered and battered over generations, but who, through it all, would be lovingly gathered, fathered, and mothered, and whose triumphant and resilient posterity would be nurtured to see, yes, today. What havoc innately innocent words are coopted to unleash on innocuous people at the hands of avaricious men; but what redemption, restoration, and reconciliation there is in time, and love. The general public is invited. Please bring an umbrella, rain or shine, as the umbrellas are a symbolic representation of the individuals sold, as well as the untold generations nested under them. The umbrellas also evoke the documented torrential rains that fell on the two slave sale days, March 2nd and 3rd, 1859, stopping only after the last enslaved person had been sold. African Americans called the event “The Weeping Time,” saying God must have been weeping during the slave sale. What a day!